My celebration consisted of doing some organizing and a bit of fall decorating. Everything I used was either already in my home or came from the garden. Hydrangeas and dried boxwood and some turkey feathers found in the field. My giant letters that I love. They really do add pop to my gold, gray and brown family room. A basketful of hydrangea in the hallway did not even put a dent in the blooms still on the shrubs. Much as I hate to say goodbye to summer, the cozy fall weather has me ready to redo, clean and generally get ready to nest for the chilly months ahead. I can hardly wait for that first fire. Kicking back and watching an old movie with a cup of peppermint tea. In the summer do you feel the need to be constantly moving, doing, being busy? if not tending the garden or being outdoors. and curl up with a blanket and a good book. Soon it will be the indoor season. It is a time of reflection on both the past and what is to come. It is a time to take stock of what we need to keep and what we can let go. I am looking forward to some letting go. It feels like the time to keep only the necessary and beautiful and let the rest find a new home. For now, some woodland decorating feels right. The weather is still sunny and golden. It isn't time to hibernate yet. I would love to dig my feet in and stop time from moving, just for a little while. Do you change your decorating for autumn and then for Halloween and Thanksgiving? Or do you just a a few warm touches and wait for Christmas to come? 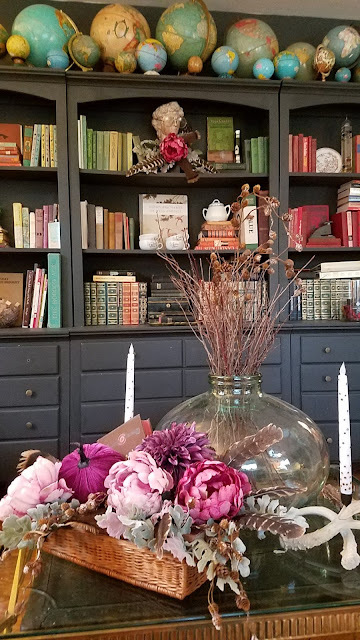 If you would like to see more fall decorating from years past you can stop here, and here. Totally random note, as I was searching for my post links I realized I had only posted 35 times last year, which of course was partially due to the upheaval of breast cancer and then a hysterectomy two days before Thanksgiving, so not a lot of decorating got done. The big surprise was that I only posted 15 times this year. Totally missed the fact that I was absent so often. My Tamoxifen makes my brain fuzzy so maybe that is my excuse, but seriously I had no idea. I love Blogland and I need to get back to posting as well for the sake of my sanity. Do know that although I may have seemed distant I was checking in on all of you each day. Have a beautiful week, P.
I'm so jealous of your hydrangeas! They look so pretty mixed with the black accents. Beautiful! What a beautifully appointed home, Pam! I love it!